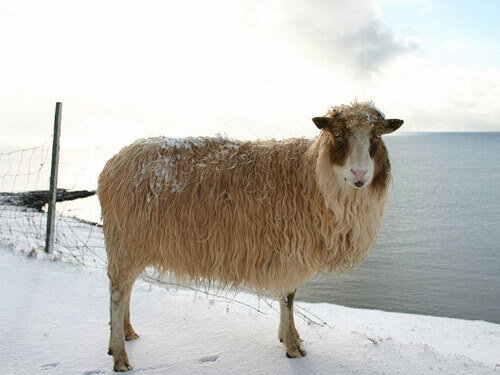 Faroes, or Faeroes, sheep are related to Old Norwegian, Icelandic, and perhaps Shetland breeds. They are not gregarious and tend to be territorial. Faroes forage in small groups, spreading to cover the entire area, behaving somewhat like Icelandic sheep. They are small and well adapted to mountainous terrain. Their color varies from white, grey, light red, dark red, chestnut brown, to black. However, due to the low price of wool, Faroes sheep are sheared primarily for the comfort of the sheep. Their lambs reach a slaughter weight of 20 to 45 pounds at 5 months of age. A good ewe will weigh about 45 pounds at 6 to 7 years of age. Rams weigh from 45 to 90 pounds. Bone structure is light, but strong. They are seasonal breeders, with singles being most common.